In Chimaltenango, the geo-political department where AMIDI resides, 60% of the population is poor, and 85% of the poor are Mayans. Widespread poverty has disturbing consequences for Guatemala; the country has the highest rate of chronic infantile malnutrition in Latin America, and the third highest prevalence in the world. Two devastating events intensified the hardship suffered by Guatemala’s indigenous people: the severe earthquake of 1976 and the 36 year civil war (1960-1996). The massive earthquake destroyed most of the modest adobe houses in Pachay las Lomas, the village that is now AMIDI’s headquarters. Accustomed to adversity, the families rebuilt their small homes. 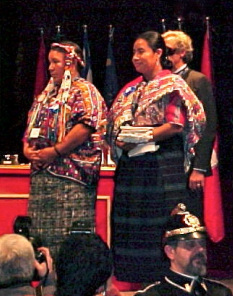 The Chimaltenango region became a heavily embattled area in the fight between the Mayans and the Guatemalan government. 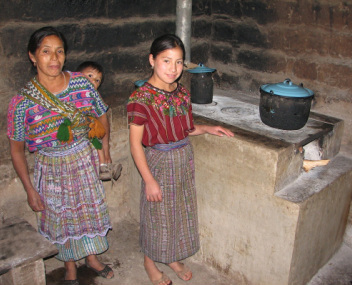 During the years of conflict, the Mayans fought against political intolerance, economic exploitation, human rights abuse and denial of access to basic education and health services. The government massacred many villagers. Pachay women lost their husbands and other family members. Ana Maria Chalí Calan, the woman destined to found and lead AMIDI, saved her family from the death squads by hiding with them for weeks at a time in the wooded mountains. On one occasion, when Ana Maria was nine months pregnant, the army was advancing on her village and she was in labor. She remained in her home. Unassisted, she gave birth to her eldest daughter before fleeing into the forest for three weeks. As with many events in the lives of AMIDI members, Ana Maria’s solitary childbirth illuminated the future for her. She vowed to become a midwife and help others. Her husband was one of the village men to survive the civil war. As a farm laborer, he spent time away from the village, tending coffee and other crops on ranches owned by wealthy landowners. Subjected to toxic agricultural chemicals, he developed cancer. On his death bed he asked Ana Maria to continue her dedication to the women of the village, uneducated women who, in the aftermath of the civil war, had become sole providers for their large families. With innate leadership ability and only a second grade education, she embraced his wish and pledged to focus on improving the lives of indigenous women in Pachay las Lomas and beyond. With encouragement from local NGOs, Ana Maria and 9 other brave, humble, uneducated women survived the inertia of Guatemalan bureaucracy to create AMIDI as a legal entity in April 2000. Their vision: to be an organization that generates work so that families can improve their standard of living. To ensure sustainability and success, they set short and long term goals for education, weaving, farming and health. Recognizing that harmony breeds strength, AMIDI members adopted a work ethic based on cooperation and consensus. Although they realize many priceless benefits, no member receives monetary payment for work on behalf of the association. AMIDI is a volunteer organization. U. S. market for their fine table weavings. Please continue your support of AMIDI. We welcome new friends and donors.